Championship Chest Circuit: Own The Pec-king Order! Prominent pecs are within your grasp. Use this circuit designed to blast the chest from multiple angles with intensity and efficiency! To build size and strength, you must hit your chest muscles from multiple angles. You can't mess around in the weight room. You must hit your chest with intensity and speed. Rule No. 2 hits on a key point: Chest development is really about mastering the basics and then training hard and consistently. Reg Park, Arnold Schwarzenegger, and Dave Draper—these Golden Era bodybuilding champions hammered their chests like there was no tomorrow. Now Branch Warren and Johnnie Jackson carry the torch and bring home massive trophies to match their titan chests. This workout is my favorite combination to hit the chest from incline, flat, and decline angles. You will do giant sets to blast the pecs quickly and continue on with your day. If you're up to the challenge, take this workout to the weight room and push out impressive gains! Do each exercise without rest to complete one circuit. After you finish the circuit, rest for two minutes to drink water, catch your breath, and stretch your pecs. Beginners and lifters new to giant sets should perform two rounds of this circuit. Intermediate lifters should aim for three rounds and advanced lifters should go for 4-5 rounds. After this, your pecs will have no choice but to grow. This will be a battle. Don't take it lightly. Come mentally and physically prepared. The routine should take no more than 20-30 minutes based on the number of rounds. It's quick and intense. Perform this routine once per week for 6-8 weeks to see its full potential. 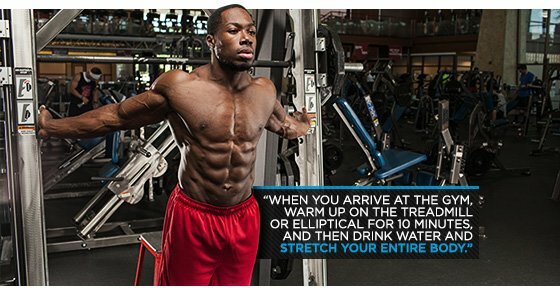 Warm-Up: When you arrive at the gym, warm up on the treadmill or elliptical for 10 minutes, and then drink water and stretch your entire body. Make sure to warm up before you stretch or you could be susceptible to injury—nobody grows when they're hurt. Prepare mentally while you warm up. Building muscle is a mental game. Make sure the incline angle isn't too high or you will work your shoulders more than your chest. 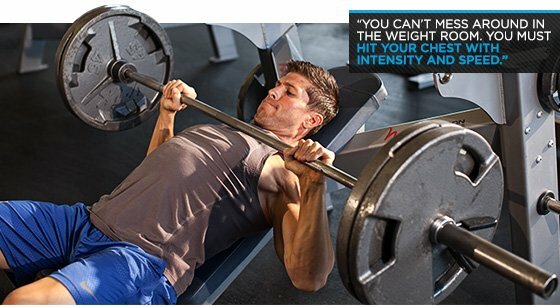 Lower the bar to a cadence of one thousand one, one thousand two, one thousand three, and explode the weight up as fast as possible when the bar hits your chest. Squeeze the chest muscles as hard as you can for a second before lowering the weight back down. Use weight which you can handle for 8-10 reps.
Move to a flat bench, grab heavy dumbbells, and use the same lifting cadence as before. Don't let the dumbbells touch at the top, and keep constant tension on the muscle by holding the weights away from each other. Squeeze at the top for a second before repeating the motion. When you finish, grab lighter dumbbells for the next movement. Use dumbbells you can handle for 8-10 reps.
Use a different cadence for this movement. Lower the weight to a five-count before bringing it up and squeeze the muscle for a two count before lowering again. At this point, leave your ego at the door and use dumbbells that allow you to lift safely. Going too heavy after the previous movements increases the risk of injury. Shoot for 12-15 reps.
Place your feet on a bench with your hands on the floor. Push-ups from this angle target the chest similar to a decline movement. Try to pump out as many reps as possible until you reach failure. If you can't do this exercise properly due to fatigue, then do regular push-ups until you develop strength to do them with elevated feet. If you really want to push it, start with your feet up, reach failure, and then place your feet on the floor and continue until failure again.